Wind energy, being so abundant, especially in coastal areas, it is worth enough the use it very widely. As we know we are facing the depletion in the fossil fuels, thus this is the right to use the energies that are readily available in abundance. We have already dealt about the pros and cons of wind energy, wind farms, wind mills etc, but not uses, even though it is what we aim at. Here, we deal only with the uses of wind energy and thereby reaching the ever best use of wind energy. The movement of air is called wind. A very natural process that occurs due to uneven heating of the atmosphere by the sun, wind formation also depends on the surface features of the earth as well as the earth’s rotation. Let us see how air movement occurs with a simple example. The atmosphere over land surface is hot because of the combined heat of the sun and the land. The air over the surface of the sea is comparatively cooler because it is cooled by the ocean. When hot air over land rises upwards, (as hot air always does), the air over the sea rushes towards that space to take its place. This is how winds blow. Wind energy is abundant in many parts of the world. According to the American Wind Energy Association, it is characterized by wind-power density classes, ranging from class 1(lowest) to class 7(highest). Wind power density is measured in watts per square metre i.e. how much energy is available at the site for conversion by a wind turbine. Wind speed is also assessed in these classes. The most popular use of wind energy now is in generating electricity. But all through history wind has been used for other purposes too as seen below. It was utilised in water transport, by boats and ships using sails in addition to manual power to travel across rivers, sea and oceans. As far back as 200 BC, Wind powered machines were used to ground grain in Persia and pump water in China. It was the merchants and crusaders who brought wind technology to Europe from these places. The Dutch used large wind pumps to drain lakes and marshes in the Rhine River Delta. The first windmill for the production of electric power was built in Scotland in 1887 by Prof James Blyth of Glasgow. His cloth sail wind turbine was set up in his garden and powered the lighting in his cottage in Marykirk in Kincardineshire. Though he tried to offer the surplus power for lighting the streets of Marykirk, its residents refused as they believed electric power to be ‘the work of the devil’. Wind powered Vehicles – This was tried in Australia. The vehicle was first drawn by kites harnessing the power of the wind. The batteries were charged when the car was in motion and when there was no wind, the car ran on the stored battery power. This is a really green way to power a vehicle. Wind powered sea ships – Winds have been used since ancient days to drive water transport. Using the same technology as above , huge kites was used to convert wind energy to move a cargo ship. Thus consumption of fuel and carbon dioxide emissions are drastically reduced. The ever best use of wind energy is generating electricity. While talking so much about wind energy and its uses, it is very clear for any common man that it is being widely used for generating electricity. It is the best potential use of it. Even though many other uses are being listed above, it is worthless if we do not highlight power generation as the best use. Let us see how wind energy is converted to electricity. The kinetic energy in wind is converted into mechanical energy and then electric power using Wind Turbines. This is a high tech version of a wind mill. The wind blows on the blades causing them to spin. The shape of the blades is similar to the wings of an aircraft and the wind lifts the blades rather than push them. Sensors can detect how much is the intensity of the wind and the direction it blows from. The blades are connected to a rotating shaft or rotor, in turn connected to a generator where the mechanical energy is converted to electric power. Electricity is transmitted via cables to a substation and then through power lines to homes and businesses. 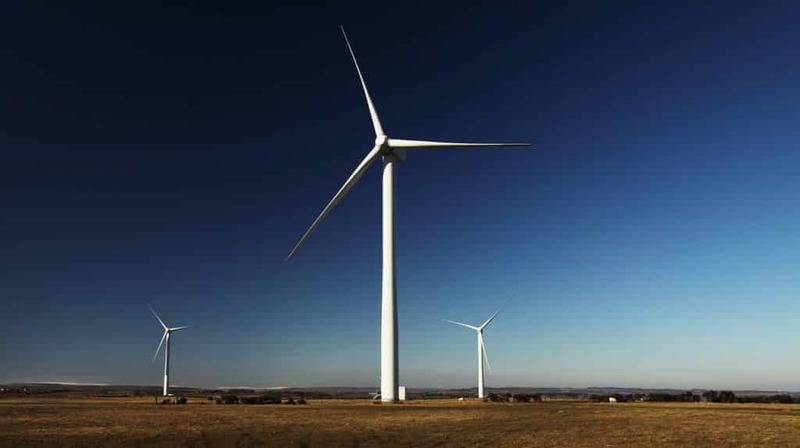 Horizontal axis wind turbines – these are more commonly used for power generation. Individual wind turbines create power on a small scale for e.g. for a single home or a farm. Large groups of wind turbines called wind farms or wind parks generate more power. Onshore wind farms – These are built on a land site where sufficient wind blows at a regular pace. Some may consider the visual impact of wind farm unappealing. Offshore wind farms – These are more expensive to build than onshore wind farms. But the advantage of having higher and consistent wind speeds offshore and thus continuous power generation make it an effective choice despite its cost. Another advantage is of not being visible to everyone. Scotland’s first commercial floating offshore wind farm Hywind has been operational since October 2017 and is said to be very effective. Wind energy is a green source and the most abundantly available source of energy. The only drawback is that it is an intermittent source i.e. the wind does not blow always. Countries like Denmark produce 40 % of their energy using wind. Other countries in Europe have improved their wind power generation capabilities, thus reducing dependence on fossil fuels and reducing their carbon footprint. Wind energy has very strong and stable levels of public support and now needs beneficial regulations and investments by the governments to increase its growth.